If you haven't already, make sure to read our recent article on the Boston Islamic Seminary, a new religious educational institution that claims to be training "vibrant members of America's pluralistic society, working collaboratively with people of other faiths." As our article points out, the Boston Islamic Seminary (BIS) -- and its parent organization, the Islamic Society of Boston (ISB) -- are not moderate at all. Both BIS and the ISB have a tendency to employ and promote extremist clerics and activists. In 2016, for example, the ISB hired an "associate imam" named Abdul-Malik Merchant. Merchant seems to dislike Jews. 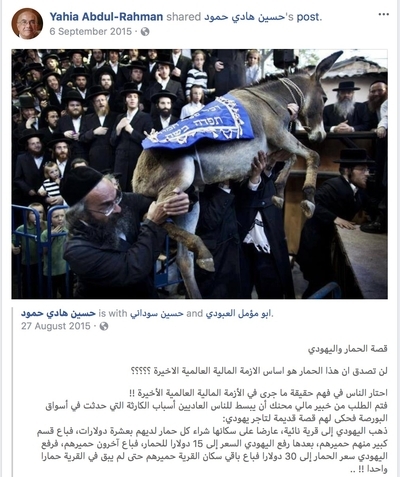 In a Facebook post discussing Jewish "plotting", he published text claiming: "The Jews wanted to kill Jesus the son of Mary (peace be upon him) because there [sic] normal way or tradition was to kill the prophets." And on a blog run by Merchant, a variety of anti-Semitic scripture is quoted: "Oh assembly of Jews! You are the most disgusting of the creation to me. You killed the prophets of Allaah..."
Now, we have uncovered new evidence of intense anti-Semitism expressed by BIS faculty. Yahia Abdul-Rahman is an "instructor" at BIS, where he teaches courses on "Islamic finance." Abdul-Rahman is a noted expert in his field. BIS describes him as the "father of Islamic banking." While working at Citigroup, Abdul-Rahman launched the "first ever Sharia-compliant stock portfolio." In addition, he helped establish the Industrial Bank of Kuwait and the LARIBA Bank of Kazakhstan. Under his watch, LARIBA established the first sharia-compliant bank in America. Since then, Abdul-Rahman has written two books on the subject, one of which he claims was a best-seller. Abdul-Rahman is also, however, a determined anti-Semite. His Facebook page is replete with unpleasant jokes about Jews, support for the Muslim Brotherhood's struggle against Israel and links to neo-Nazi websites. 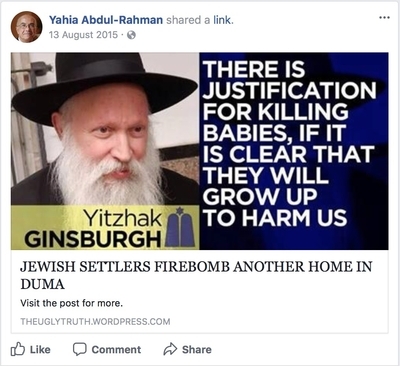 In August 2015, for example, Abdul-Rahman posted a link to "The Ugly Truth," a website that describes itself as "intelligent 'anti-Semitism' for thinking Gentiles." The website contains conspiracy theories about Jewish control of governments and media, as well as claims of Jewish plots to murder children and discussions about "de-Judifying America." 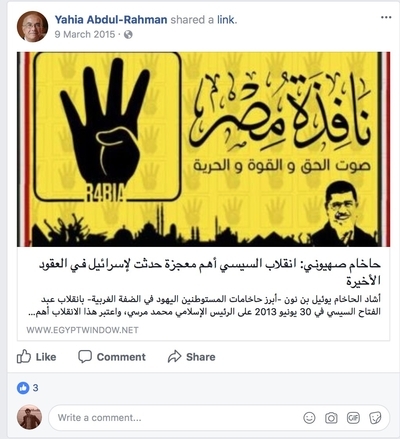 Abdul-Rahman also spreads Muslim Brotherhood conspiracy theories that Egyptian leader Abdel Fattah el-Sisi is of Jewish origin and his government is secretly supported by Jews. Another post shared by Abdul-Rahman claims that any Muslim who fails to oppose Israel is no longer a Muslim, and has a "Jewish heart." And in a joke supposedly exposing Jewish complicity during the 2008 financial crisis, Abdul-Rahman posts a story (see screenshot below) explaining how a Jewish merchant swindled an entire village out of its savings and assets. To the bafflement of observers, the Islamic Society of Boston has long enjoyed strong support from local politicians, media and even Jewish community leaders and rabbis, in spite of the institution's long history of extreme anti-Semitism. The question that many wonder now is: exactly how anti-Semitic do you have to be to lose that support?